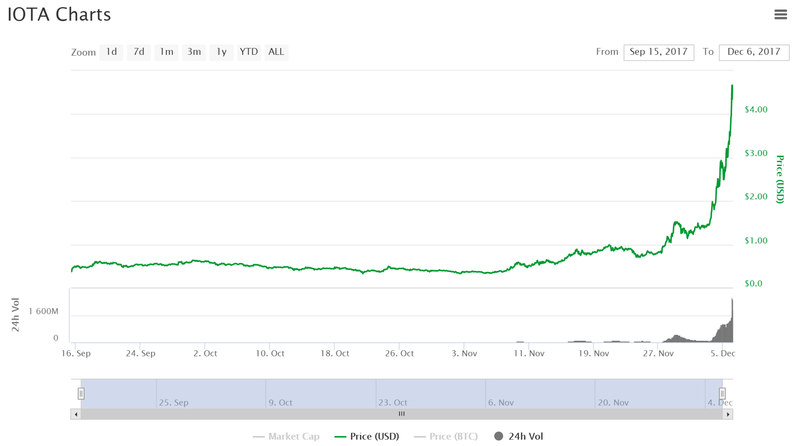 IOTA has seen a meteoric rise in just the past few days, with prices hitting $5 on major exchanges, and even hitting ~$9 on the coinone exchange. As of this writing, we are experiencing a slight pullback to about $3.75, which I don’t think will last very long at all. Just a few short weeks ago, IOTA was hovering around rank 10–15 in terms of highest market cap. Back then, IOTA was really only available on two major exchanges, Bitfinex and Binance. But since then, we’ve seen IOTA being added to a host of other popular exchanges around the world, which seems to be a major factor in this sudden spike, including coinone, OKEX, and CoinFalcon. This sudden spike has also caused the trading volume for IOTA to reach levels (~$2 billion) eclipsing Ethereum’s (~$1.6 billion), with only Bitcoin having a higher volume (~$10 billion). In turn, IOTA’s market cap has also reached a massive ~$15 billion, beating the caps of other major companies like AMD, Atlassian, and Seagate. It’s market cap currently sits around $10 billion, as of this writing. If one compares the price of $1.50 on Dec 3rd to the local peak of $5.50 on Dec 6th, that is a 3.67x increase in only 3 days! That is an increase of roughly $11 billion of market cap into this cryptocurrency, in just 3 days! There are 72 hours in 3 days, which translates to a compounded growth of roughly 1.82% per hour or 54.2% per day!!! Just for fun, if this growth could be sustained permanently, IOTA would reach a market cap of $1 trillion (roughly $360/Mi, a nice, satisfying number) in 13 days!!!!! That’s the power of exponential growth. Obviously though, this level of growth is unsustainable and unreasonable. IOTA will probably peter out of its growth before then, but it will reach new base levels, possibly becoming a top 3 very soon. One thing I can say for sure, though, is that cryptocurrencies are truly, already, a new paradigm in 24/7 trading with these wild levels of commerce. Does the current price make sense? I believe IOTA still has a long way to go in terms of adoption levels and maturity; they still attribute their software as being in beta! Once the nodes, wallets, and dapps reach production levels, we will see IOTA reach astronomical levels of fortune, probably beating Ethereum and Bitcoin. Whatever happens, it’s going to be a fun ride. Here is a list of events where I attribute my purely speculative change in the price of IOTA to certain events and occurrences, sorted in ascending order of the level of price change. These numbers are very rough, so bear with me. Kindly leave comments if you think these numbers can be fine tuned or adjusted. Now we can make a few concrete price predictions. But there are still a few parameters to consider. I’ll utilize a few different cost bases for the starting point and take conservative and liberal stances on some of the estimates above. The reason for different cost bases is that some of these events are already in the psyche of investors, leading to speculative prices already. Starting with a lower cost basis cancels some of the speculative pricing. Conservative means taking the lower number in price prediction ranges as well as fewer occurrences of multi-event possibilities, such as fewer Hollywood films about IOTA rather than many films. Liberal is just the opposite. In all of these, I create a price multiplier, which is obtained by multiplying all events’ estimates together. For example: (coordinator open sourced: 1.05) * (UCL wallet: 1.1) * (Smart contracts: 1.3) = 1.5015 => 50.15% increase. So with just these three events, we could see a ~50% rise in price. Taking conservative estimates, we obtain a price multiplier of roughly 38x! With liberal estimates, we get a price multiplier of 552x!!!!! Now let’s take a few different cost bases: $1/Mi, and $5/Mi. This gives us two different price ranges, which, granted, are quite wide. Conservatively, and assuming these inevitable events happen over the next year or few years, we could see Miota priced between $38–$190. This would yield a market cap of $105 — $528 billion!!! For comparison, Bitcoin’s market cap is about $220 billion and Ethereum’s $42 billion, as of this writing. Assuming IOTA keeps up its pace of development, and the other coins lag behind, it has a decent chance of becoming number #1! And these are the conservative estimates. If we use our liberal multiplier of 552x, we get a price of $552 — $2760 per Miota and a market cap of $1.53–$7.67 trillion!!!!!! Keep in mind, these are the liberal estimates and could take some years to come to fruition. And none of these estimates take into account the mysterious “Q” entity being thrown around IOTA circles. Taking a rough multiplier out of these potential events give us 2.2x. So you could multiply all the estimates above by 2.2, and you’ll get another potential price prediction. Some of these events will highly likely occur during the lifetime of IOTA; some have already occurred. But IOTA has improved itself every time and come out the other end. It is still in beta with lots of potential room to grow. We are living in very exciting times in this crypto space. Prices drop by 50% in a day, and increase by 150% the next. We are definitely going to see many upticks and downticks with twists, turns, and surprises over the next few years. I’m excited to see what the future holds for crypto in general, but especially for IOTA! If I had to make a concrete prediction with a price and a date, then I would take the average of the conservative estimates above and say that I predict the price will reach $114/Miota by December 2018. Edit: I forgot about plans to implement private transactions. Let’s add another 20% to the estimates! This gives me a new conservative price range of $47–$235/Mi, with a December 2018 estimate of $141/Mi. Also, people are asking how I came up with some of these numbers. A lot of it is based on a combination of my past observations and my judgment. For example, when Binance listed IOTA, the price jumped from about $0.50 to $0.60 or +20%, in just a few hours! And IOTA was much less well known back then. So when IOTA will be listed on more major and more mainstream exchanges, and now that IOTA is a top 5 coin, I think we will see more drastic price jumps. Whatever Coinbase adds as its fourth coin will receive ridiculous amounts of capital. You can follow me and my company, P Rizz Ventures LLC, on Twitter, Medium, Facebook, and LinkedIn.